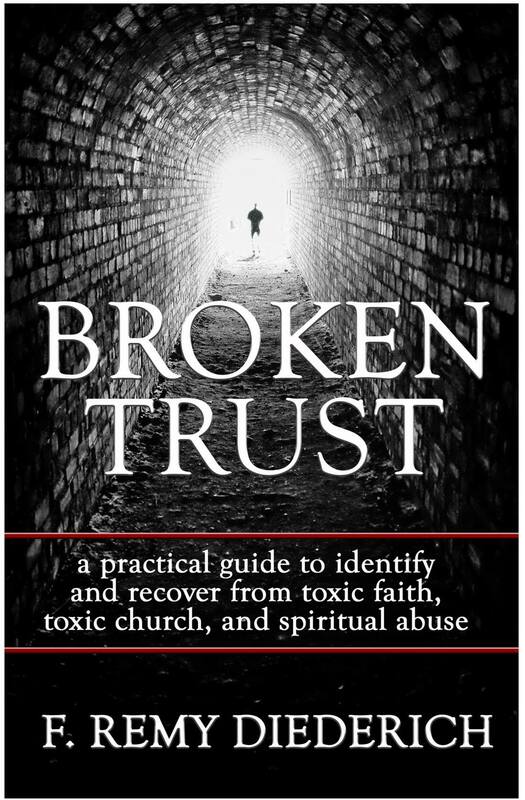 I just finished reading the new book “Broken Trust, a practical guide to identify and recover from toxic faith, toxic church, and spiritual abuse”. I met the author Remy Diederich recently on the “Spiritual abuse in YWAM” group on Facebook. That is a very active group with hundreds of members and daily updates. Although I was never in YWAM, at one time I wanted to be, I just never had the money to join their expensive and fraudulent DTS (THANK GOD) but they are very closely related to and recruit heavily among Hawaii”s Calvary Chapels. I have spoken now with the author of this book, Remy Diederich a few times via chat and email. I am amazed at the wisdom he has regarding toxic and abusive churches but also realize this kind of knowledge comes at a great price. I am about to read the book a second time and go a little slower this time. It is the best explanation I have found on how people in churches cloak abuse under the guise of spirituality. I wish I had a copy of this 25 years ago, but its a new release, and people are just now beginning to understand what makes abusers tick. To be fair, some people don’t know they are being abusive, they might still be able to change. Others are very good at it and don’t know any other way. Both need to be confronted. Now finally, with Gods wisdom and many answered prayers, a few new and now very close friends, and finally Remy’s book, I know clearly now I am not the only one who has learned to identify these manipulators in church leadership. The abusers power lies entirely in their ability to isolate and diminish the abused persons concerns and filling their minds with doubt, condemnation, shame and guilt. Most people never identify that they have been or are being taken advantage of by their trusted clergy. Others start to get a pretty good idea. Often times two people, sometimes very close to each other will witness the same behavior or abuse. Only one sees it for what it is, the other doesn’t. This could cause broken friendships, even divorces. Remy makes a couple of good analogies in Chapter 27 on page 102-103. Survivors can eventually “smell” abusers a mile away, even when others can’t. We see the subtle tones and gestures in their behaviors and we start to catch what’s being said and what’s being left out of their sermons or conversations. People who have survived abusive relationships become super sensitive to abuse. When questioned, the abusers will quickly accuse their examiner of being a “gossiper”, “over reacting” or “hyper sensitive”, a “sin sniffer” or a “pharisee” or even “slanderous”. In an earlier chapter Remy describes how often times the abused is in a “no win” or a “double bind” situation. The best thing for most people to do is just leave, quickly. On page 45 of the book Remy uses the analogy of a burning house. Do we criticize the person who fled the burning house for using the wrong exit or not exiting quickly enough or for trying to put the fire out first? The answer is No. As long as they safely get out. For most people the correct answer is just to leave. For a few stronger minded and stronger stomached individuals, confronting the leadership of your church may be the way to go but this often ends up back in a double bind, or as they say, spitting in the wind. Anyway, go out, get Remy’s book. I wish I had something like it 25 years ago but God has been gracious to me. I have not left the faith,. I consider myself a stronger Christian now more than ever before. The last pastor who wrote me a nasty email accused me of many things but it was too late for him. I see through them now. They have no power over me anymore. Calvary Chapels may not technically be a “cult” but I have experienced much cult like and abusive behaviors among the top leaders of Calvary Chapels in Hawaii. YWAMs and Calvary Chapels both are showing up more and more on Cult awareness websites. I won’t throw the baby out with the bath water and say they are “all” reprobate but I suspect at least a few are. I don’t know much about the other churches in Hawaii but was with a friend last night who has suffered obvious abuse from another large charismatic church in Hawaii. Guys please, if you see smoke, there is probably a fire. Just leave. If any of you need help, Email me or leave a comment here, i will respond; or just get Remy’s book. Don’t let these people lay their trips on you. God is all you need. Anything else is legalism. leave these people to themselves. Get alone with God. He will show you everything you need. Remy does a fantastic job of laying this all out on pages 60-61. The first thing to do is leave. Remove yourself from the abusive situation. #2 protect yourself if being physically or (if I may add) legally threatened. This is important enough Ill bold it. When you leave an abusive relationship, resist the temptation to return. Well meaning believers will tell you “YOU MUST go to church” but they are wrong. This is like telling someone who just got out of an abusive marriage “THEY MUST get married again right away”. Think about how ridiculous that sounds! Take a break! God alone is all you need! Get perspective, this can be accomplished through a variety of means. For me it was new friends. Remy recommends journaling, prayer or even professional counseling. Next find a new community or like minded believers. Develop a new devotional life free of legalism and pharisee-ism. Finally establish new boundaries. I didn’t do every thing in the precise order of Remy’s book and there are certain things i’ll never do. (I don’t really Journal except for this blog, and I don’t go to counseling except for the occasional trusted close friend) but pretty much got everything else done. There are one or two loose ends I need to tie up before I can truly move on with my life. I probably have a few more days of spit on my face, some spit still my own (from the wind) and others from getting yelled at at point blank range by the last and final abuser I have yet to break free from. Link to buy Remy’s book here. This entry was posted in Apostate Church, Calvary Chapel, Christianity, spiritual abuse and tagged Heresy, Spiritual Abuse on October 3, 2017 by mikeuslan.